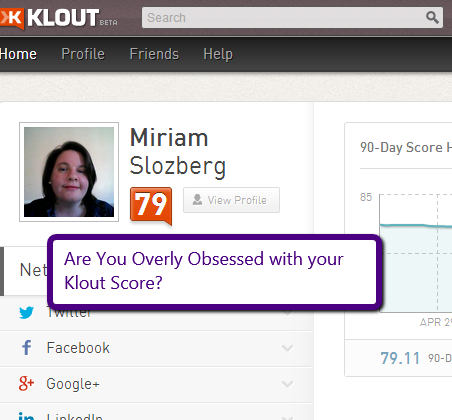 Are You Overly Obsessed with your Klout Score? As you know, I am a full believer and supporter of Klout, and I do believe in the idea of scoring your online (and offline) presence since social media is simply a part of life now- and it will become even more prevalent as time goes by. Therefore, if you are dealing with the public on a professional level ie. an entrepreneur, coach, author, politician, musician, broadcaster, or anyone with a great purpose who wants to stand out in their area of interest/expertise- you must build an online presence through social media which will help you in your offline world too. The one way to find out how much of an online presence you have is by how high your Klout score is. People are looking at your score, for the purpose of seeing how engaging and interactive you are through social media- and dare I say, to see how much influence you have on your network. In fact, I have been hired by several clients to run their social media campaigns because my score had caught their attention. Even though 5% of users may have a score of 63 and above, it is recommended for professionals to have a Klout score of over 70. That is when it starts to stand out. That is really the purpose of the Klout score- it is an attention grabber, and once you have someone’s (could be a client waiting to hire you, or if you are applying for a marketing based position, it could be the employer- remember, people are looking) attention based on your score that is when that individual starts digging into your profiles, and looks at the kind of content you share with your network. That is where the real meat is, as Klout may be considered to be the potatoes. There are so many people who absolutely hate this fact! They have a hard time accepting it and go at finding faults with Klout by saying how inaccurate it may be (nothing is going to be totally accurate anyway), or how “flawed” it is, the list goes on. Anyway I did indeed early this year write a blog post about the facts about Klout in response to seeing many judgmental Twitter chats in regards to Klout. At the same token, there are those who are quite the opposite of those who bash Klout. I am not talking about those who support Klout and its purpose, more so individuals who are overly obsessed with their scores to the point they end up using unethical gaming tactics to push it up. I am also talking about those who also let a dropping score convince them to quit their social media activities because whatever they do online does not seem to reflect on their score anyway- so why should they bother with social media? And yes, this is the attitude I have seen many times. It is definitely the wrong attitude to have. I admit, after my Wikipedia page was taken down, it was disheartening to see my score of 83 drop to 79, which I should not complain about to begin with anyway. However, Wikipedia has become more strict in regards to the type of references to have in order to have a page stick and mine were not strong. When the time is right, I will have it reinstated, not for only my Klout however for many other purposes as it is indeed good for business. Anyway, that is besides the point. My advice to those who are overly obsessed with their Klout scores is- and if you happen to fall into that category- just to remain active and consistent, and engaging on your networks all of the time- ethically. Your score will reflect on that! Do not compare your score to your friends’ either! And I do recommend you do check your score at least 2 or 3 times a week just to see how you are doing with your online engagement. Think of it as an online accountability tool. Do not get overly stuck on your score dropping a few hundredths of a point here and there as that is normal fluctuation. However, if you are consistently dropping while you are consistently engaging online- you may have to restart your connections in your Klout dashboard as occasionally the stats are not collected properly if this kind of thing does happen. Sometimes this does happen. If you develop the attitude of developing a strong and positive online presence and are consistent with it which is the most important thing- you will be fine, and your score will in the end take care of itself. No, I’m not obsessed about anything. I go with the flow, live a happy life, enjoy the joyful journey and just do what I do. At the time, they said the average Klout score was 20, he was above average at 26 and was very pleased with himself. I hadn’t even ever heard of Klout and just did what I did. I think I hover between 66 and 72 most of the time now but still, I don’t do anything to intentionally change it. I just do what I do. Thanks for the reply Kathy and good move on your part. Just stay consistent and engaging. It will take care of itself, the score that is. And yep, if people are contacting you because of your score, then see, it does have an impact! Thank you again! I did not know about Klout until recently so I am still learning the way it works, scores, and what implications that has for building my expertise. Thanks for this post – great information which will help me figure out what I am doing and how to build up my Klout. Thanks for the comment Carin, glad to help! When I first found out about Klout I think I had a score of 45 or so. I have climbed I think but I don’t check my score all that often. I just do what I do and help other. I’m a supporter of Klout as well. I think the criticism is based on peoples resistance to anything that measures and quantifies since doing so can be a blow to self esteem. So they take a sour grapes attitude regarding it. I agree Klout is not perfect, even I have some issue with it. Mainly the use of the word “influence”. Klout measures reach and engagement which is not exactly the same as influence. Meetup.com….liking a status is one thing, joining a group and commiting to get up from the desk and going someplace is a whole other matter. Quora…Answering questions and being recognized for the quality of a particular answer and answers in general contributes to your reputation as the goto person on a particular topic. Klout experts SORTA makes up for Quora’s absence but it’s not really the same thing. Causes.com, It takes a little more influence to get a person to sign a petition than to get a retweet and a LOT more to get a donation than to get a facebook share. Hopefully Klout will someday integrate these and/or similar sites into their algorithm to truly measure influence. Until then it still is a useful tool for measuring reach and engagement (popularity) which can reflect on potential influence.